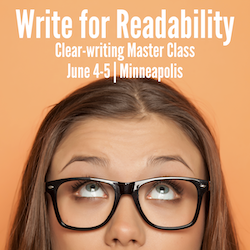 Do a deep dive in 2 days Master a four-part system for Catching Your Readers at our persuasive-writing Master Class on Oct. 2-3 in Dallas. Think Like a Reader: Move people to act. Go Beyond the Pyramid: Master a format that’s been proven in the lab to reach more readers. Cut Through the Clutter: Make every piece you write easier to read & understand. Lift Ideas Off the Page: Draw readers in and reach nonreaders with display copy. Get a Writing Workout With Wylie: Take your message from ‘meh’ to masterpiece. Save $100 with our group discounts! Ready to move readers to act? Earn a free, 3-month subscription to Rev Up Readership — a $97 value — if you’re among the first 10 to register. by Aug. 2, 2018, to receive a full refund, minus a 20% handling fee. by Sept. 2, 2018, to receive a 75% refund. Sorry, no refunds after Sept. 2, 2018.